I have QB 2009 for MAC. I have received and deposited payment for an invoice. When I look at the paid invoice it has "PAID" stamped on the invoice. 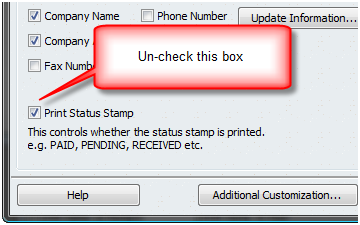 However when I create a .pdf the "PAID" stamp does not appear on the invoice. How do i create a pdf with the "PAID" mark and later print this "PAID" invoice. Once that is checked, save the template by clicking OK and try to print or save your invoice as PDF and see if the stamp appears. For your reference, I used the following sites. I realize the second one is for windows but in most cases the windows and mac versions are the same. Im new to the mac and love it but am stumped on this point. I am having trouble registering my QB Mac 2007 on my new MacBook.